Chili-garlic sauce and sugar add a touch of sweet and spicy to this tempting meal. Cut lamb into long 2-inch wide strips along the grain of the meat, then cut crosswise (across the grain), into thin slices. This ensures tender mouthfuls. In a medium bowl, combine the lamb, 1 tablespoon of the soy sauce, and 2 teaspoons of the cornstarch. To make the stir-fry sauce: In a small bowl, stir together the stock, the remaining 1 tablespoon soy sauce and 1 teaspoon cornstarch, the chili-garlic sauce, and sugar; set aside. Heat a wok or large frying pan over high heat. Pour 1 tablespoon of the oil into the hot wok, swirling to coat. Add the lamb and cook, stirring and tossing, until lightly golden, about 2 minutes. With a slotted spoon, remove to a plate. Reduce heat to medium-high. Pour the remaining 1 tablespoon of oil into the hot wok, swirling to coat. Add the green onions, ginger, and garlic. Cook, stirring until fragrant, about 30 seconds. Add the asparagus and cook, stirring and tossing, until bright green, 30 seconds to 1 minute. Stir the sauce to blend and add to the pan. Cook, stirring until the sauce thickens, about 1 minute; cover and cook until asparagus is tender-crisp, about 1 minute. Return lamb to the pan and just heat through. 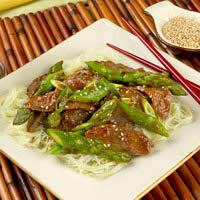 Garnish with sesame seeds and serve immediately with steamed rice or rice noodles.